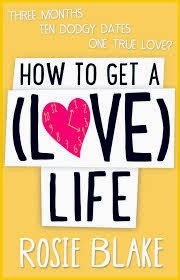 FlutterbyBooks: How To Get A (Love) Life by Rosie Blake. How To Get A (Love) Life by Rosie Blake. This is another wonderfully fun and fast paced book from the fabulous new digital publisher Novelicious. In it we meet Nicola who is challenged by her colleague Caroline to find herself a date ready for Valentines day, which is a mere three months away. In order to meet the dare Nicola throws herself into a variety of new situations; not particularly easy when you're used to living alone and are totally stuck in your own routine. I really enjoyed reading this story. The characters are so bubbly and fun to get to know. I particularly loved Nicola's bat-loving-brother and also her colleague Caroline. Watching Nicola come out of herself and chill out a bit was lovely and she get's up to so much in her quest to find a date... she tries everything from golf, DIY classes and all weather watersports and even books herself on a singles holiday. But will she find love in the end? You'll just have to pick up a copy of How To Get A (Love) Life and find out. Bad Angels by Rebecca Chance. Zenith Hotel by Oscar Coop-Phane. A Hundred Pieces Of Me by Lucy Dillon. Channel Blue by Jay Martel. Shopaholic Ties The Knot by Sophie Kinsella. Here's Looking At You by Mhairi McFarlane. The Engagements by J. Courtney Sullivan.